In charge of the potato salad for this year’s barbeque? Ditch the plain old classic salad and bring this one with a little flair from South of the Border. Its sweet and spicy kick, along with a fresh crunchy texture, may just well have all the guests kissing you instead of the cook at the grill. It’s a win/win; who really wants smoke in their face anyways? 2. While the potatoes are boiling, sauté the corn with a teaspoon of olive oil in a skillet over medium-high heat until the kernels begin to brown on the edges. Season to taste with salt and pepper, remove from heat and set aside. 3. In a large bowl, whisk together the mayonnaise, dijon mustard, chili powder, salt, and pepper. 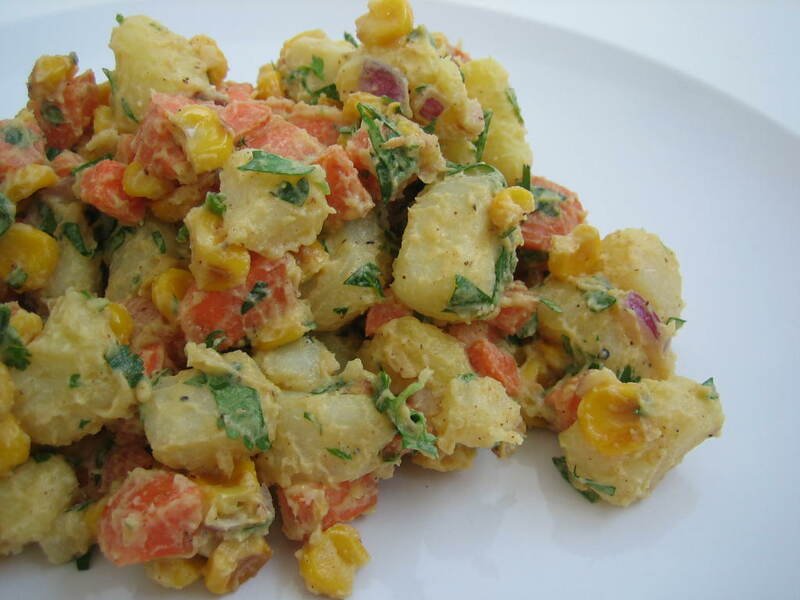 Toss the potatoes, carrots, corn, red onion, and jalapeno together with the dressing until evenly combined. Allow to cool to room temperature before serving. * This can be prepared several hours, up to a day, in advance. It will actually taste even better, all the flavors from the dressing will have absorbed into the potatoes = yum!